Welcome to our central Luton hotel, featuring our new generation bedrooms with an impressive 40" flat screen and slumber-inducing, king-size Hypnos bed. - The hotel is ideally situated for both business and leisure guests. Luton Town Railway Station is just 0.5 miles away, with connections to the North, and to London and the South. 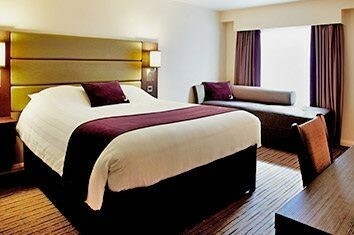 The hotel is just 2 miles from London Luton Airport and within easy reach of the M1 Junction 10. The Arndale Centre provides excellent shopping opportunities, with the Galaxy Leisure Centre offering a multi-screen complex and bowling facilities - all within a 5 minute walk of the hotel. Take M1 Motorway Southbound. At Junction 10 exit towards A1081 Luton Airport. At the first roundabout, turn left o onto London Road, A1081. Continue into Castle Street and t turn left onto Windsor Street. Take the first right into Chapel Street. And then the first left onto Regent Street. The hotel is on your left.